In this article, we will learn how to insert multiple data items using Reactive Forms in Angular. We will build a demo application for easy understanding. Recently, I was working on a project with Angular Reactive Forms. We had one requirement of inserting multiple data in a single batch using FormGroup, FormBuilder, and FormArray. There may be several approaches to this. This is just one of them that I am using. Basic Knowledge of Angular version 2 and higher. Basic Knowledge of Reactive Forms. Let’s start from the beginning to create a demo application. 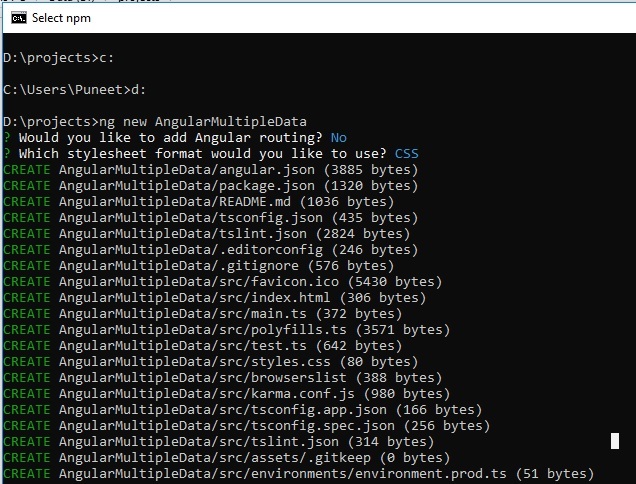 Open the Command Prompt and write the command for creating a new Angular project. Say, our project name is AngularMultipleData. The application is created successfully. Now, open your project in Visual Studio Code or you can simply open it using the command given below. Open VS Code Explorer for viewing the application structure. After the application opens in Visual Studio, open the app.module.ts file and import FormsModule and ReactiveFormsModule from @angular/forms. 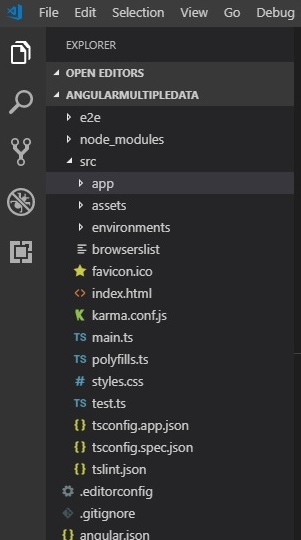 Now, open the app.component.ts file. Here we need to import FormBuilder and FormGroup from @angular/forms. Create a reactive form object with a name, say, SchoolDetailsForm and create an instance of FormBuilder in the constructor. Create a JSON object with basic data. This object holds the key value pair data. We use this data with *ngFor directive in the HTML template. Now, create a function for our Reactive form with formGroup and formControl. The For loop helps us to push the array and dynamically build the formGroup. The code snippet for that is given below. 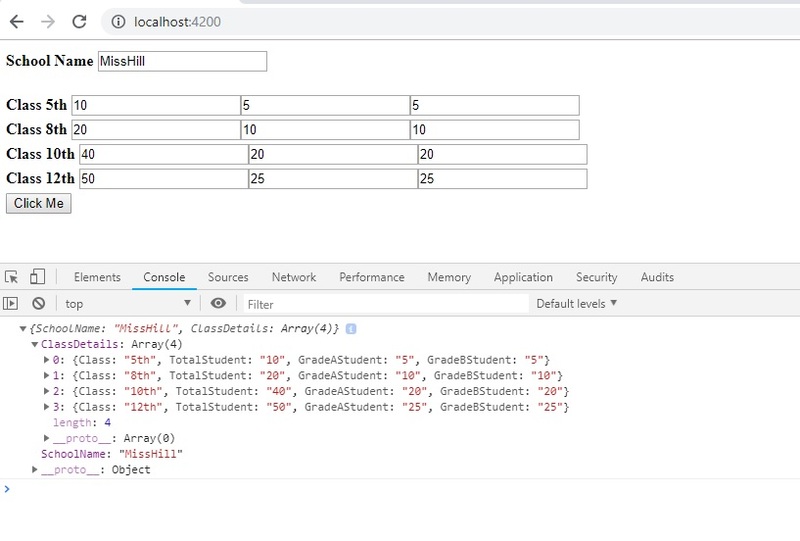 Now, create one more function that returns the formGroup with fields like TotalStudent, Grade total, and Class. The code for this is given below. The code of our app.component.ts file is given below. We have created a Save button-click event for the console data. Now, open the app.component.html file and write the following code. We used *ngFor directive for iterating the data and finding the controls of our Reactive form. Now, run the application using the following commands and open it in the Chrome broswer at port number 4200. You can see our data with fields in the console. You can pass this JSON object to the Node API or WebAPI and insert into our database. The output is shown in the following image. I have attached the .rar file of this demonstration. If you want the code of this application, please download it. In this article, we learned how to insert multiple data using Reactive Forms in Angular. I hope you enjoyed this article and learned the process. Thank you for reading. If you have any questions/feedback, please write in the comment box.